The Buffwing is a very pretty Macaw, with lots of greens and blues on the body and brilliant reds framing its face! 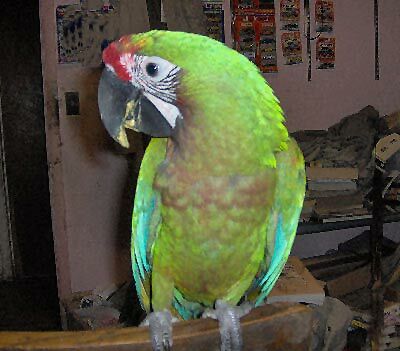 "Lepi" is a Buffwing Macaw. This is a hybrid macaw with the parents being a a Green-winged Macaw father and a Buffon's Macaw mother. The Buffwing Macaw is a first generation macaw, meaning its parents are two species of naturally occurring macaws.The Green-winged Macaw has long been a favorite pet bird for both its beauty and its good personality. The Buffon's Macaw, highly endangered in its native habitat, has been quite scarce. But it is very good natured bird and a ready breeder in captivity. Through the efforts of aviculture it is becoming more firmly established with some birds even being re-introduced into their native habitat. The temperament and behavior of hybrids are areas of uncertainty and are unpredictable. Having parents that are both sweet natured and affectionate, the Buffwing Macaw will be a very pretty bird and should be a good natured pet. All macaws require good socialization and consistent training to make good pets. The Buffwing's have the amiable nature and curiosity of their parentage, and can be a very affectionate and fun pets. Scientific Name: The Buffwing Macaw is a first generation hybrid, a cross between: Green-winged Macaw Ara chloroptera and Buffon's Macaw Ara ambigua. Description: Buffwing Macaws are a very vibrantly colored hybrid. Both parents of the Buffwing Macaw contribute to the vivid colors of their offspring, though the father's have the dominant gene and this will influence their final appearance. Most often the father is a Green-winged Macaw (male Greenwings are more common than females). Some of the characteristics when sired by a Green-winged macaw will be a large bird, with the head and beak shape more typical of the Greenwing. With its other parent being a Buffon's Macaw, that mix gives it a lot of gorgeous green. This hybrid has a green body overall, with some reds on its forehead, along its cheeks and on its chest. It is sometimes said to resemble the coloration of a Red-headed or 'Cherry-headed' Amazon. Buffwing's are a full size Macaw and can learn to talk with a general vocabulary of about 15 or more words and expressions. Social Behaviors: It is generally believed that hybrid macaws get the best attributes of the parents. In this case, the natural docile side of the Green-winged Macaw makes a good family type bird, while the Buffon's Macaw is extremely good natured and gentle.